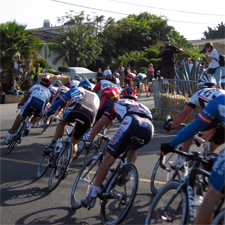 The fourth annual Dana Point Grand Prix of Cycling will take place Saturday April 10th and Sunday April 11th, 2010. On Saturday, cyclists will race along a 2.25-mile course through downtown Dana Point and the Dana Point Harbor. Time Trials begin at 7:00am. On Sunday, kids, amateurs, and top professional cyclists will race along a 0.8-mile course through downtown Dana Point. The first race begins at 7:00am and the last race (NRC Mens Pro 1) starts at 4:00pm. Kids races are free! There will be metal and prizes. See the kids racing schedule below. Enjoy the fan zone with local vendors, live music, food, and bmx demonstrations. A portion of the proceeds will benefit the Boys & Girls Clubs of Capistrano Valley and the 5th Marine regiment Support Group of Camp Pendleton.